I have been on the WordPress Writer/Author scene since mid-February, 2018, and have read dozens of posts by newbies and established writers-authors and bloggers who have advice on writing and self-publishing. Read the advice, but, folks, you have to figure this one out yourselves, even if you lose money in the process. I am what one would call a “tactile learner,” that is, I learn by doing. For instance, I learned by foolishly trying to transfer a domain from BlueHost, who claimed to be ICANN registered but aren’t (or else why would they send me an e-mail stating I needed to go through whois@BlueHost.com, when Whois is part of ICANN? WHOIS LOOK-UP is indeed part of ICANN), that transferring a domain is a fool’s errand unless you already have done such a thing in the past and succeeded. So, all I could do was withdraw my complaint against BlueHost. BlueHost can throw my domain I paid for in the trash, or hand it over to some whatever for free. When the domain comes up for renewal I will not be renewing it. Back to the original storyline. In 1995, I completed my first book for print—there was no online e-book platform back then that I could access since we didn’t have internet until 1998 anyway. The novel is called Battle of the Band, and, in those days if you didn’t have one of the Big Publishers as well as a literary agent, you either spent thousands with a vanity publisher (a very bad idea…paying them thousands, while you STILL had to market the books yourself! And you also had to sell the books yourself! ), or you spent your own money on setting up your own indy self-publishing company, getting your ISBNs, sending your book to the Library of Congress for registration (usually two copies), and paying to get the book printed. No problem—unless you unwisely got more copies printed than you knew you could sell on your own. In fact, I believe that was truly the only mistake I made: I got 1,000 copies (and over-copies besides) printed when I probably should have gotten only a few hundred. 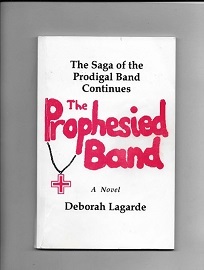 By 1998, when I had completed the second novel in the trilogy, The Prophesied Band, I only ordered a hundred (plus over-copies), and because of that, actually made a small profit. Lesson learned. And, when we got the internet—dialup—I got with a company called BookZone, was interviewed by some BookZone woman, and sold some copies through them. But mostly, I sold copies on my own. But here is the beauty of it: ALL copies of these two books were sold with NO ADVERTISING COSTS (at a very to cost to BookZone…they got minimal take from their sales, but that’s it)! The only advertising I did besides BookZone was showing up at buy-sell-trade events like the local Fourth-of-July festival or the Writer’s Conferences held by a local writer’s group called the Texas Mountain Trail Writers, or doing press releases in the local papers. So I didn’t make much money with OmegaBooks back then. But I did get the experience of self-publishing through my own indy publishing company. And I did it when I was mothering and home schooling two young children. And other motherly and wife-ly chores. And not earning any money in the process other than some book sales. Fast forward to today. After working five years as an office manager for the local Property Owners Association, I retired what with the kids in or out of college on their own. 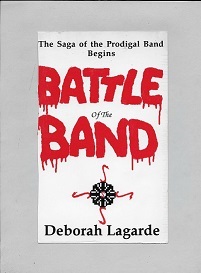 In 2016, I got serious and began on the completion of what has been posted, the FREE PDF novel, The Prodigal Band (which tells the whole story from beginning to end), here. Because I had been working and saving money for this effort, I now have the funds at my disposal (and am on Social Security and Medicare—most of the savings I have made will go toward medical expenses, which are outrageous in the USA…and dammit if I need to I’ll get it done in Mexico! I don’t live far from the border). But OmegaBooks will get what is needed. As I’ve said in other posts I had been rejected by big publishers and literary agents, so I had no other recourse but to do it myself. But now? Writers and authors, you do not even need a big publisher and you certainly don’t need a literary agent unless you’re a “celebrity” or something who likely doesn’t even write the thing! And don’t literary agents take a big swipe out of your take? Let alone big publishers? Go back to read here my post on how Stephen King got screwed before he became a celebrated author. If you have the time to write, you have the time to set up your own company, your own website, your own Amazon or whatever account, your own PDFs (using Word or WordPerfect—both can now be immediately exported to PDF), get your own ISBNs and Library of Congress registrations for $55 (which guarantees your copyright against Adobe Acrobat-owning pirates who download your book, then steal from it trying to ‘copyright’ what they have stolen!) and DMCA-documentation as well for a measly six bucks! Also, copyright anything you put online or any portions of your online books on your sites. Put your book on a Cloud format (such as Adobe Acrobat DC Cloud or Google Cloud or whatever)? Make sure you copyright it for real and submit to the Library of Congress. If a 65-year-old non-tech-savvy person can do it, so can you. Previous Previous post: Good News! This Site Is Succeeding!